Yes, that’s the beautiful Blake Lively in a Lindsey Thornburg cloak! Our Tamiami Trail blanket makes a beautiful outerwear piece. Blake Lively, fashion icon, offered this cloak on her Preserve.us website, but it appears to be sold out. Check Lindsey’s website! And be sure to read about Lindsey Thornburg’s inspirations on our blog. Her beautiful cloaks are dramatic innovations on the tradition of blanket coats that stretches back to medieval times in Europe. 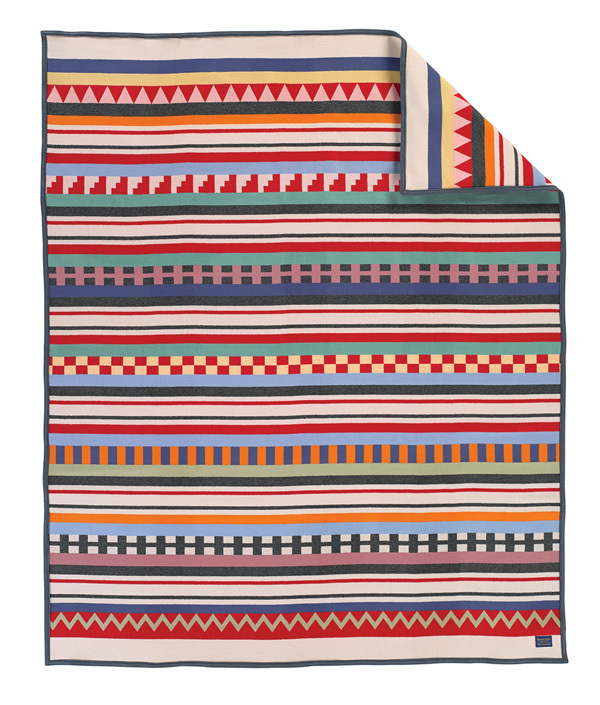 And centuries ago in the Americas, Native weavers made outerwear of their blankets, and adapted the styles to manufactured Trade blankets when they were introduced in the late 1800s. We have to tell you this stuff because we’re Pendleton, and we go back a ways with blankets. But enough history lessons. For now, just enjoy a few more pictures of a beautiful woman in a beautiful cloak.